Absolutely wonderful stuff!! I'm going to byheart this song! It's hard to believe these days, but bankers do occasionally base their decisions on rational and robust bits of mathematics. A central player in this context is the Black-Scholes equation, which won its discoverers the Nobel Prize in Economics almost exactly 11 years ago, on the 14th of October 1997. The Black-Scholes equation is a partial differential equation which tells you how to price options. An option is a way of reducing risk: it's a forward contract giving you the opportunity (but not necessarily the obligation) to buy a certain commodity or stock, for example fuel, at some specified time in the future for an agreed strike price. An option is an example of a so-called derivative, because it derives its value from the underlying variable (the price of the fuel). Derivatives and options, as we all now know, can be traded in their own right, and have the potential to make people very rich, but also to break the bank (as happened literally with the Barings Bank in 1995). One important question if you're in the business of trading derivatives, is how much they should cost. Since options are all about the future, it may seem as if pricing them should involve a certain amount clairvoyancy, but in fact the Black-Scholes equation does it all for you (for a type of option called a European call). All you need to know to use the equation are the current price of the stock and strike price of the option, the expiry time of the option, the interest rate and an estimate of the versatility of the stock. In their original 1973 paper Black and Scholes built their model on the assumption that the stock price was a function of a Brownian motion. A Brownian motion is a random motion, as you would expect to see when you let a particle float in a liquid or gas. Mathematically, you can describe it as a stochastic process: at any given time, the stock price (or the particle) moves up or down (or, with a particle, in any of the available directions) with equal probability. Using this model for stock price behaviour, Black and Scholes found that the problem of pricing an option becomes equivalent to that of solving the heat equation from physics. The original Black-Scholes model made some simplifying assumptions, for example that shares don't pay dividends, but it is possible to work around many of these and obtain more sophisticated and comprehensive models. These have been at the heart of financial mathematics ever since. Unfortunately, Fischer Black died two years before the award of the Nobel Prize, so Myron S. Scholes and Robert C. Merton (who's name isn't attached to the equation) ended up sharing it. If all of this makes you wonder who should really be blamed for the current financial crisis, read the Plus article Is maths to blame? For more in-depth information on derivatives, read the Plus article Rogue trading? The Internet is huge. With mobile phones and other devices now being hooked up as well as computers, it will soon comprise many billions of endpoints. In sheer size and complexity the Internet is not far off the human brain with its hundred billion neurons linked up by around ten thousand trillion individual connections. If you're finding it hard even to read these huge numbers off the page, how can anyone be expected to cope with complexity on this vast scale? While mathematical tools that deal with complexity have experienced rapid development it recent years, there still isn't an overarching science of complexity, a mathematical toolbox serving everyone who's dealing with it in whatever shape or form. This month a group of experts from a range of different areas got together in Cambridge to try and remedy the situation. It was the first ever meeting of the Cambridge Complex Systems Consortium. Delegates included a climate scientist, a former head of MI6, a neuroscientist, a sociologists, and a mathematician. Plus went to see them, to learn about their struggle with complexity. News from the world of maths: Want some Plus in print? Want some Plus in print? If you're a fan of our regular Outer Space column by John D Barrow, then you can now get your hands on some of it, and much more besides, in book form. In A hundred essential things you didn't know you didn't know Barrow applies his usual style and insight to anything from winning the lottery, placing bets at the races, and escaping from bears, to sports, Shakespeare, Google, game theory, drunks, divorce settlements and dodgy accounting — all obviously things that only make sense with maths. The bite-sized chapters are easy to digest and form formidable weapons in your war on ignorance. Good science is all about good method. Every scientific study worth its salt should begin with a clearly delineated question to be investigated, followed by the systematic gathering of evidence (often involving the use of statistics), and concluding with a sober-headed interpretation of evidence found. Plus recently came across an excellent example of correct scientific method in the British Medical Journal, which we would like to share with our readers. The paper in question is a longitudinal cohort study of the displacement of teaspoons in an Australian research institute. Plus is thinking of launching a complementary study into a phenomenon often observed in the Plus offices: the spontaneous acquisition of dirty tea cups. When I packed up to leave the UK, I found 10 forks, 4 spoons and 1 knife that weren't mine that had somehow migrated from work (not Plus) to home. I returned them without fuss before I left! For those of you who enjoy Ben Goldacre's Bad Science column in the Guardian, now is your chance to meet him in person. 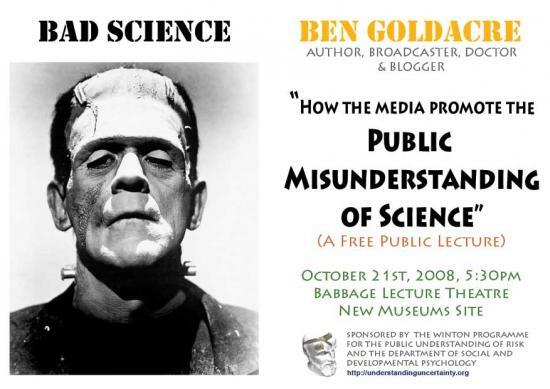 Ben is talking about "How the media promote the public misunderstanding of science" on Tuesday 21 October (next week) at 5.30pm in the Babbage Lecture Theatre, New Museums Site, Cambridge. It's a free public lecture and everyone is welcome, just turn up on the night. The lecture is brought to you by Understanding Uncertainty, the Winton programme for the public understanding of risk at Cambridge. You can read more from the Understanding Uncertainty team on their site, or in their column on Plus.